"We've removed the ceiling above our dreams. There are no more impossible dreams." In his April 30th column for WSJ.online, science writer Jonah Lehrer writes that "architecture and design can influence our moods, thoughts and health." As he explains, scientists are discovering that our outlook and our performance on different tasks change in response to aspects of our surroundings "from the quality of a view to the height of a ceiling." The article put me on a memory path I've traveled down scores of times over the years. It begins when, as a child of three or four, my parents took me to a Roman Catholic mass in a Gothic-style church where the choir sang Gregorian chant. 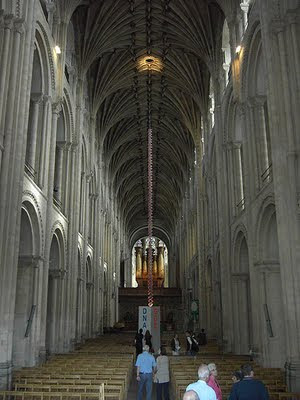 As light streamed through the stained glass windows and the chanting voices arced and dipped I suddenly had the feeling that my mind was floating through the top of my head to a place way up high in the vaulted ceiling. I wasn't frightened by it. I felt both calm and energized. Although I gave up religion in my early teens, over the years, when I've needed to think through a difficult problem or even just recharge, I have often found my way to a high-ceilinged church. 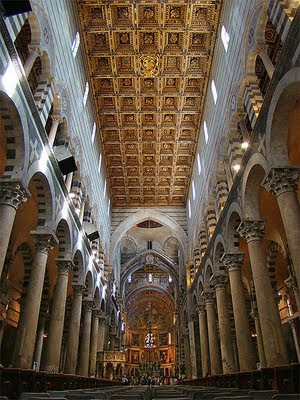 Even without the chanting choir, the light and those high, beautiful ceilings work a certain magic. 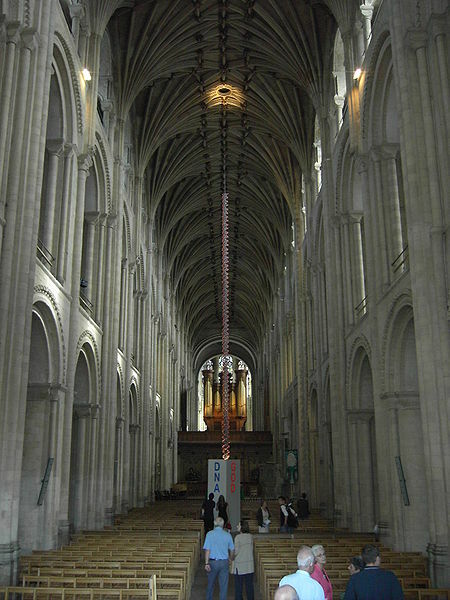 Robert Louis Stevenson wrote, "Mankind was never so happily inspired as when it made a cathedral." I find that inspiration contagious. The next time you find yourself near a Gothic-style church, stop in and see how it feels. On days like this I start thinking it's a pity that so few people still wear hats. 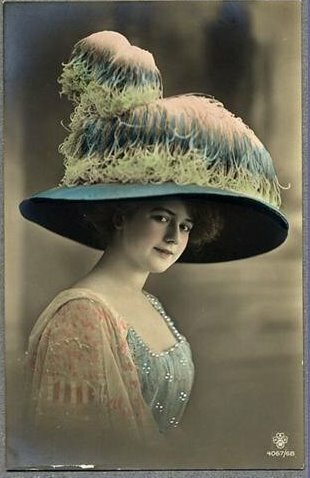 This was the era known as the "Mauve Decade," so it's safe to assume that many of the ladies were sporting that fashion color. 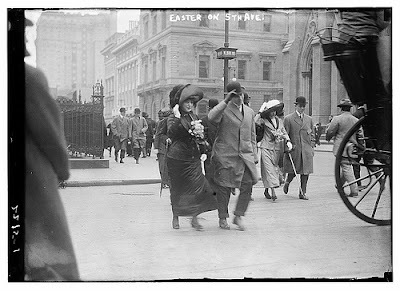 Below, more fancy bonnets from Easters past when people proudly donned their finery and stepped out to promenade with their peers. A windy, overcast day didn't stop these strollers from showing off their Easter wardrobes. Was this even for Easter? 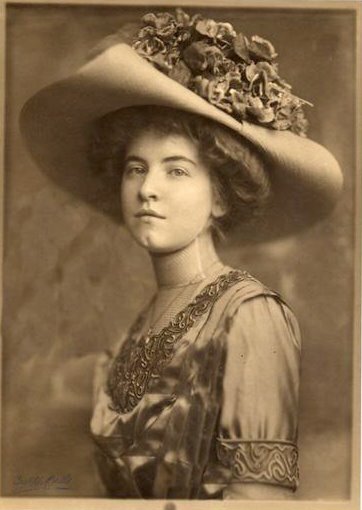 Who knows, but what a fine hat. I don't know if this hat was designed to look like a Shih Tzu, but if so — mission accomplished! And we mustn't forget the tune. Have a lovely day. 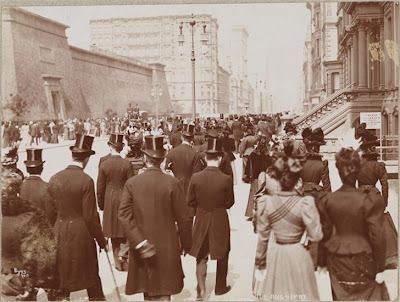 About a month ago one of my favorite Internet places, the Shorpy Historic Photo Archive, published this photo. It was taken at the beach on Coney Island in 1905. I haven't been able to stop thinking about it. Do yourself an enormous favor and go here to see it full size. Just look at this little one, with her hair ribbon and biggish bare feet and face filled with bliss. Coney Island was a place that beggared the imagination in 1905 — more Disney than Disneyland, with Dreamland and Luna Park enticing visitors from all over the world with exotic architecture, rides and attractions. At some point I realized my father was a newborn that summer and started wondering what else was going on with children in and around 1905. Life was short: The average woman lived 47.3 years and the average man, 46.3. Work was hard. The average work week was 59 hours, for which the average worker earned $12.98. The average teacher earned about half as much — $325 a year. Only about half of all children attended school, probably because so many of them were working. Child labor was unregulated until 1938, when the FDR administration passed the Fair Labor Standards Act. 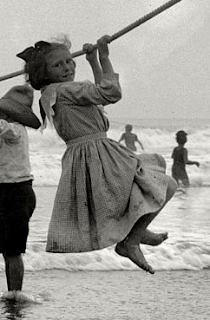 To engage in child's play on a beautiful summer's day is always a joy for a child, but for some of these children it was probably a rare luxury as well. E. E. Cummings might have had them in mind when he wrote this poem. It's always ourselves we find in the sea." 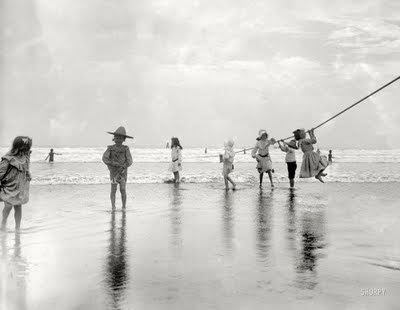 Bonus: I found a film clip purporting to be a trip to Coney Island in 1905 by a group of boarding school girls. I seriously doubt it's a documentary — much of it seems staged. But it does show Coney Island during that same, magical summer. 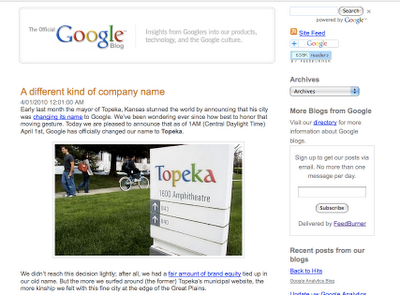 My 2010 April Fools' Day story, with updates. 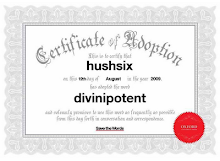 Divinipotent Daily loves whimsy and silliness, and since whimsy is the madly beating heart of a great April Fools' Day prank, I am a highly bemused camper at least once a year. Some April foolery — like the BBC’s classic 1957 report on the annual spaghetti harvest along the Italian-Swiss border, which you can see by clicking here — is timeless. Most is just enjoyable ephemera. Last year I decided to collect the pranks I came across throughout the day (without actually searching for them) and note them here. I found a bumper crop. The closing paragraph was my favorite part: “In a related development, 10,000 angry Tea Partying Medicare recipients protested against themselves today, demanding that ‘government health care keep its grubby hands off our government health care.’ Said one protestor, ‘I simply hate myself for benefiting from a program that proves that everything I stand for is flat-out wrong.’” The release was from Joel Berg of the New York City Coalition Against Hunger, which has a tradition of entertaining its friends in the press every April 1st. 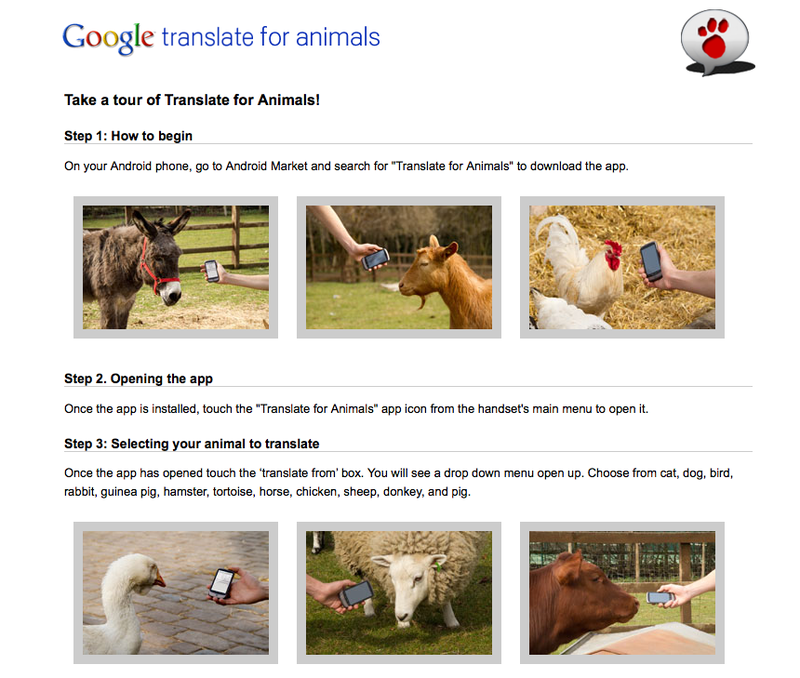 Google introduced an exciting new application for its Android phones on April 1, 2010: Google Translate for animals. That's right: a special app to enable us all to make like Dr. Doolittle. Writer Eugene Finerman’s always entertaining, history-focused blog, Your RDA of Irony, arrived in my inbox with praise for the 600-year reign of the Byzantine Empire. Finerman proposed that for the U.S. to achieve that kind of stability, we should do to our government officials what the Byzantines did to theirs: castrate them. Readers of the U.K. paper the Independent awoke on April 1, 2010 to the startling news that CERN, which operates the Large Hadron Collider, was planning to install another Hadron Collider within London’s Circle Line tube (subway) tunnel. 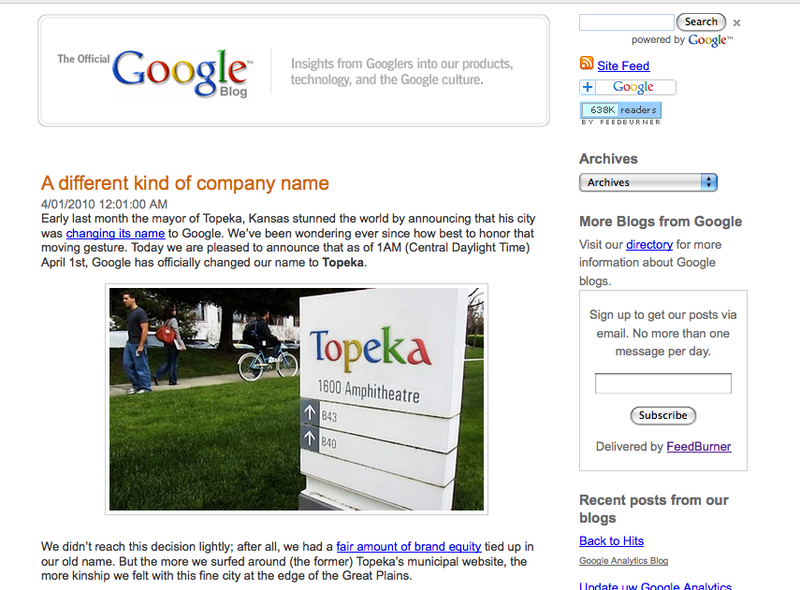 Did I mention that Google changed its name to Topeka last April Fools' Day? An e-mail from the Center for Biological Diversity proclaimed this shocking news: “Palin Recants, Salazar Adopts Wolf” — reporting surprising position reversals by vocal anti-environmentalist Sarah Palin and Interior Secretary Ken Salazar, who removed the handful of wolves still living in the western U.S. from the endangered species list. 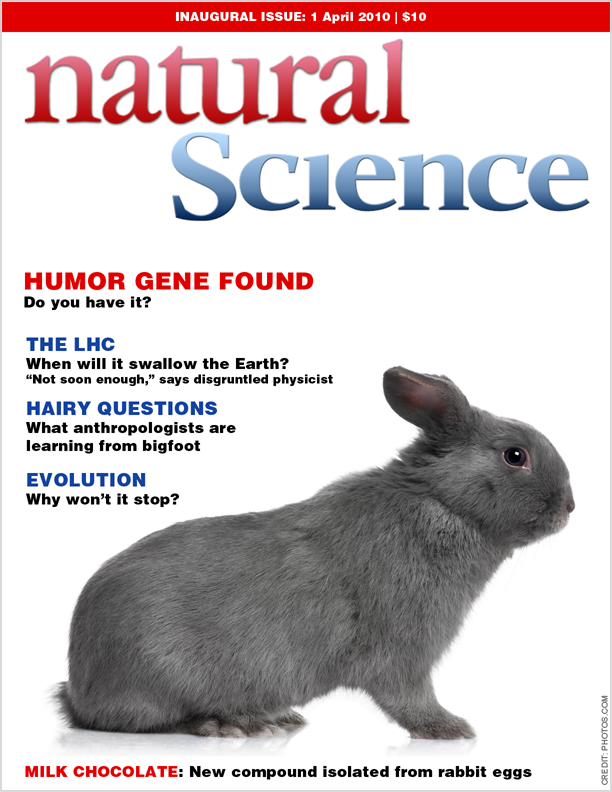 Science writer Ed Yong, on his blog for Discover magazine, revealed the discovery of the gullibility gene and a related part of the brain called "the inferior supra-credulus." At last — an explanation for Birthers! Cognitive scientist Mark Changizi reported that Twitter was reducing its maximum character count from 140 to 20. Science writer Rebecca Skloot’s best-selling book, The Immortal Life of Henrietta Lacks, tells the story of cancer victim Henrietta Lacks, whose “HeLa” genes — taken from her without permission — have led to countless scientific breakthroughs. 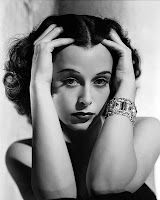 But on April 1, 2010 the blog The Real Hela revealed that the true source of the HeLa gene was not Ms. Lacks after all — it was film star Hedy Lamarr! Don't care about cellular biology? Then how about flying cats? 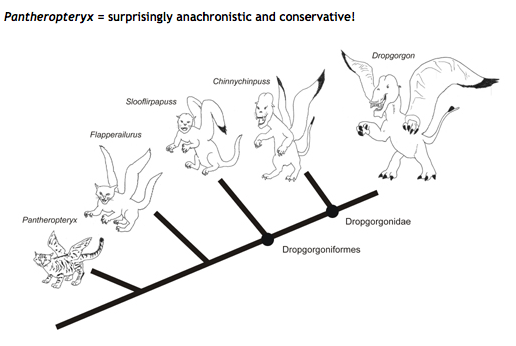 The Tetrapod Zoology blog offered up a genuinely disturbing report about “the evolution of dropgorgons and winged cats” (see illustration below). 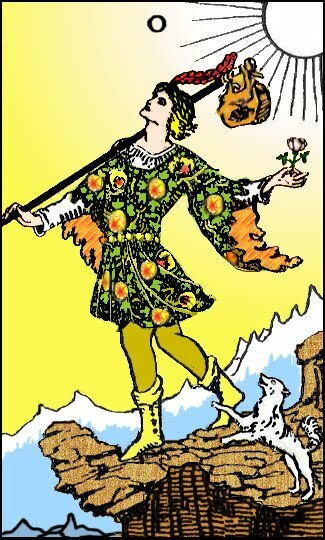 Mark your calendars: 365 days to the next day of whimsy.